Once explorers had discovered New Zealand’s mountains and how to reach them, Europeans began to climb them. The transition from exploration to mountaineering began in the last two decades of the 19th century. A. P. Harper, the son of explorer Leonard Harper, returned from Europe in 1889 after climbing in the Alps. He teamed up with New Zealand’s last significant explorer, Charlie Douglas, to investigate a number of mountains and river valleys on the West Coast. Harper was important in forming the New Zealand Alpine Club in 1891. 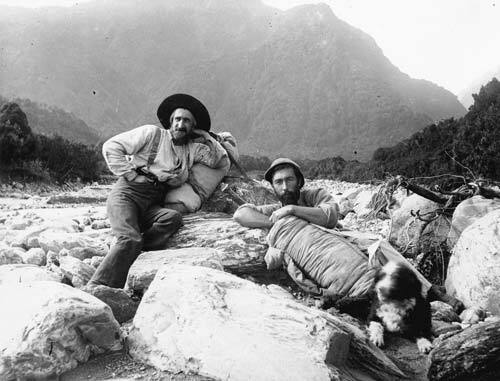 Here, Douglas (left) and Harper are taking a break in the Cook River valley. So too is Douglas’s dog, Betsey Jane. Hi Bridget, you can find more information on requesting a copy of the photograph on National Library's website here: https://natlib.govt.nz/records/22369189.